You know how it is. 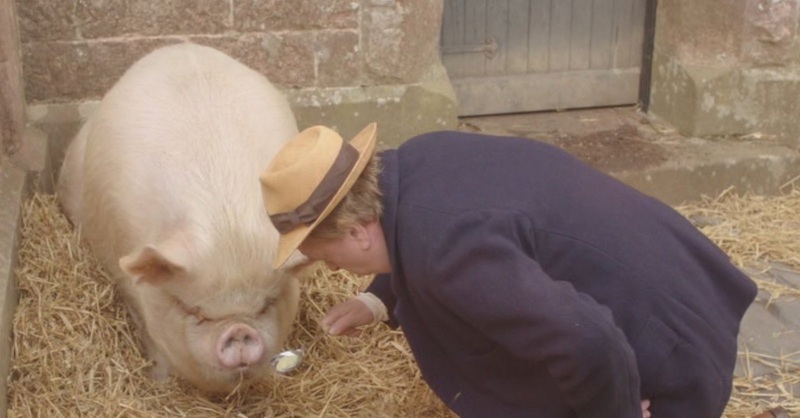 You just want to be left alone to spend some time with your beloved prize pig, but what with the various demands of running an estate, things never seem to work out. 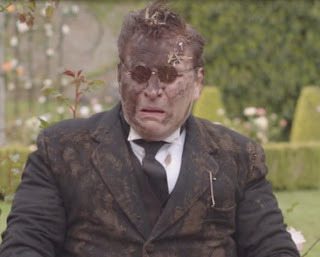 That's the situation Clarence Emsworth, the owner of Blandings Castle, finds himself in during the mad-cap escapades of The Blandings. This series, based on the stories of P.G. 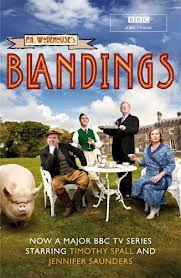 Wodehouse, stars Timothy Spall as the pig-loving aristocrat and Jennifer Saunders as his sister Connie. In addition, Clarence's perpetually broke son Freddie Threepwood and the long-suffering butler Beach add comic touches to the wacky household. Episode One begins with only two weeks until the Fat Pig contest, and wouldn't you know it, the pigman Wellbeloved gets sentenced to spend a few weeks in jail for public drunkenness. It turns out the magistrate who sentenced him isn't exactly impartial, as he also has a chubby pig entered in the contest. The poor Empress, Lord Emsworth's pig (who has won the competition 2 years in a row), is pining for her pigman and just won't eat for anyone else. Luckily, the Lord's flighty niece, Angela, has taken up with a cowboy newly returned from America (much to her mother's dismay), and he knows a secret trick for communicating with pigs. Connie, Lord Emsworth's sister, has had enough of the slack ways at the castle and decides it's time to straighten things out in Episode Two. She does this by hiring a secretary named Baxter, played by David Walliams (at his smarmy best). There's not much time to get everything sorted out, because Connie's old friend Veronica Schoonmaker and her millionaire husband (and five dogs) are on the way for a visit. Freddie, Lord Emsworth's son, sees an opportunity to make money, and quickly orders several tons of dog biscuits that he hopes he can convince the wealthy visitors to buy. The Blandings Fete is coming up in Episode Three, and Lord Emsworth is definitely NOT looking forward to making a speech to the assembled guests, no matter how much Connie insists that it's his duty to do so. A visit from two London Fresh Air Children, sent from the dingy capital to enjoy some unspoiled countryside, soon adds more chaos to the house. A nearly unintelligible, but perpetually irate, Scottish gardener is also a thorn in Clarence's side, with his plan to install a gravel path on some perfectly harmless mossy ground. Episode Four finds Clarence with a full house again. Freddie has brought home his new "wife" in the form of Portuguese dancer Paquita, but he tries to keep their relationship a secret from his aunt Connie. Cousin Gertrude is staying, but she's pining for her unsuitable boyfriend, the accident-prone Rev. Bingham, who also comes for a visit under an assumed name. 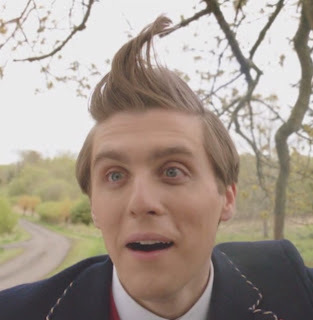 With a society ball on the horizon, Connie has thoughtfully arranged a German dancing master, Herr Schnellhund, to give Lord Emsworth some lessons. With all those comings and goings, who is responsible for the missing silver? Just when he thought he was home free, Clarence is dismayed when Connie re-hires the dreadful Baxter to resume his secretarial duties in Episode Five. It seems that Clarence has misplaced a very important letter from their sister Julia, and an exasperated Connie needs an expert to sort out the mess in the study and find the missing letter. Meanwhile, Freddie is in hot water yet again, and brings the sister of the man he owes money to home with him to fetch the cash. She, inexplicably, takes a liking to the butler Beach. In the meantime, Clarence's grandson George tries to find live targets for his shooting practice. Connie is thrilled when the widowed Lady Littlewood comes with her son for a visit in Episode Six, but it soon becomes apparent that she is looking to become the new lady of Blandings Castle. Freddie swears off women, until he catches a glimpse of the gorgeous new "pigman," Monica Simmons. It will take the combined efforts of Beach, Connie and Freddie to expose the devious Lady Littlewood's plans before she takes over and throws them all out. The poorly pig, the Empress, is "flapping her palsied trotters." "He's so crooked he could hide behind a spiral staircase." "Apparently, he suffers from being an American." "I shall eviscerate you with a small, blunt spoon ill-adapted for the purpose." "The posteriors of the goddess have been ravaged!" "Her non will be plussed off the scale!" "It bloats the bowel and dulls the mind." "You look like an ostrich goggling a brass doorknob." 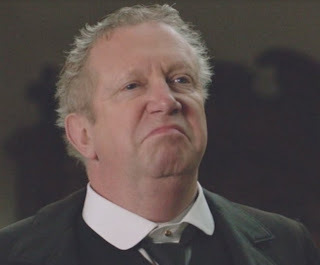 "I suggest you disembarrass yourself of the table nappery." "I did not creep. I manifested silently." "Would you excuse me? I have to blackmail my father." "That is just noise leaking out of your face." "My brother has never been with us, but somehow his physical presence endures." "Do you bash the shuttlecock from the feathered end?" I really enjoyed all the performances and the beautiful country scenery in the series. And we can only hope that the regal Empress will get her own spin-off show!